A text-book, bone dry Manzanilla from the town of Sanlúcar de Barrameda, light and fresh, very tangy, clean and crisp with just a hint of saltiness. 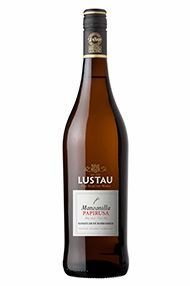 London IWC 2005- Silver Medal An archetypical Manzanilla, aged in the cathedral-like calm of Lustau’s Bodega in Sanlucar De Barramada. Sea breezes, carried down the Guadalquivir Estuary, add inimitable freshness to this poised and poignant wine. Almonds with a twist of citric acidity inform a palate which has few peers as an al fresco aperitif, with or without a plate of mariscos. The Wine Advocate - The NV Manzanilla Papirusa from Sanlucar de Barrameda has an intense straw color with a smoky nose of roasted nuts. The palate is dry and light, with clean, pungent flavors, showing finesse and good length. Lustau is doing a good job to improve their Manzanillas, working with a good almacenista in Sanlucar. Drink 2013-2014. Emilio Lustau was established in 1896 and was initially a small family concern until the founder`s son-in-law placed it on a business footing. The firm is perhaps best known as pioneering the Almacenista system, whereby individual dry sherries are produced from small private holdings. These are bottled under Lustau`s name but with the individual bodega's name on the label as well. Today they are amongst the most sought-out Sherries in the region. The firm also produces superb wines from its recently acquired 170 hectare Montenegrillo vineyard. Manzanilla is a (bone-dry) style of Fino Sherry originating from the port city of Sanlúcar de Barrameda in the province of Cadiz. Sanlúcar de Barrameda's exposure to the maritime weather and high humidity contribute to a stronger flor yeast growth and influence (fresh acidity and salty character) than in Finos from Jerez or El Puerto de Santa María. Manzanilla Pasada - approximately 7 years in solera, so that the impact of flor yeast begins to fade, though not long enough to become an Amontillado. 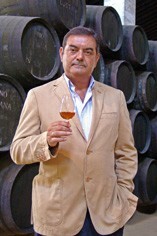 Manzanilla Amontillada is similar to a manzanilla pasada but in some cases aged as long as 12 years, taking on more of the qualities of an Amontillado Sherry. El Puerto de Santa María is a city located on the banks of the Guadalete River in the province of Cádiz, and also the name of a style of Fino sherry matured in bodegas in this city.